Back during the summer months of this year, an HTC spokesman said that the once cancelled HTC Grip fitness tracker was being given a second chance after "extensive wear testing and user feedback." The Grip was supposedly getting prepped for a release sometime before the end of this year. But there seems to be a dark cloud that is hanging over this device. In a statement published yesterday, HTC said that it and Under Armour would "launch a fully integrated digital ecosystem of products early next year." While the statement seems to cover more products than just the HTC Grip, it would seem that the fitness tracker would be included in the "ecosystem of products" referred to by the manufacturer. The HTC Grip features a curved 1.8-inch PMOLED display, and pairs with all Android phones running 4.3 or higher, and iPhones running iOS 7 and up. It uses Under Armour's apps and accessories to track your heartbeat and pulse. 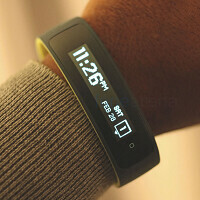 It also allows you to monitor your exercise and fitness regimen. The HTC Grip has already been cancelled once, and now it will be delayed until next year. Hopefully, the device will be worth the wait. They must delay everything. The end!!!!! Was that a thing? Well, nobody cared. Nails dropping in the coffin. Glad I'm team Microsoft not depending on greedy fat green robot called Android. Microsoft band 2 is the way to go. Make sure to come back in a year or two when MS jumps the boat with android focused smartphones with its own MS skin filled with MS services. Cause 2-3% of world market share after 5 years of trying and loosing with endless billions thrown in all directions is a great team to be supporting. or conversely, you're asking: what the h*ll is phonearena. google it.